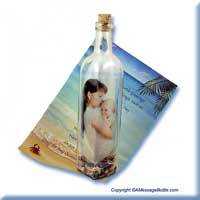 Stock# - 04001tgs Photo Message in a Bottle - We are the Original Creator of the Photo Message in a Bottle. 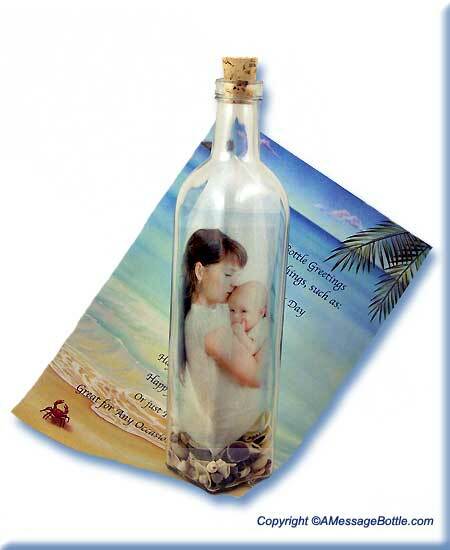 The photo is actually safely placed inside the bottle creating a wonderful, and very unique illusion, that will be cherished forever. 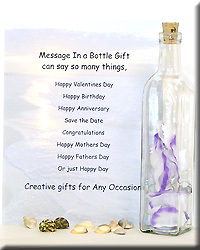 This is, without a doubt, one of the most specialized gifts you can share with someone. 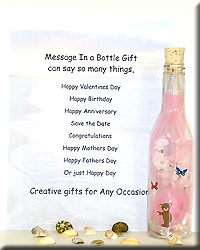 This specialized gift can be shared with your family members and friends. 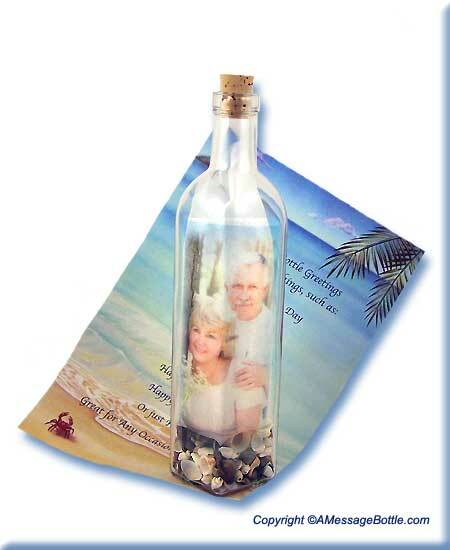 Now you can send a very Unique Message in a Bottle that captures a photo of your loved one, a special gift that will preserve Time in a Bottle. 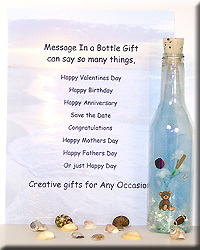 This is truly one of the most unique gifts you could possibly send to your loved one. Instructions: Upload any color or black and white photo, (No larger than 450 pixels by 450 pixels). 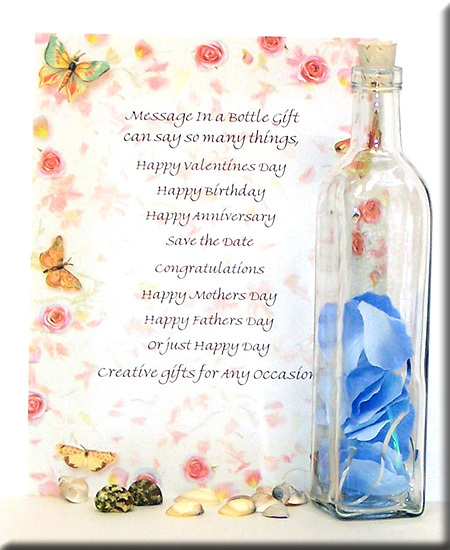 For best results and we will modify it as needed, fill in the Options to the left and compose your personalized greeting for the scroll. 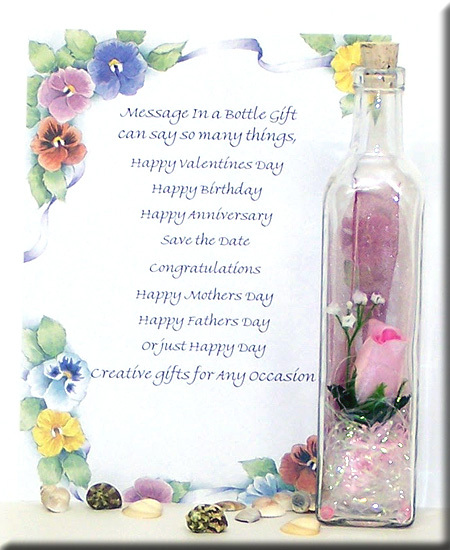 When composing your greeting we recommend including a Salutation and Closure for identification by the recipient. Photo measures 6" tall x 2 1/2" wide, (size may vary depending on final layout). 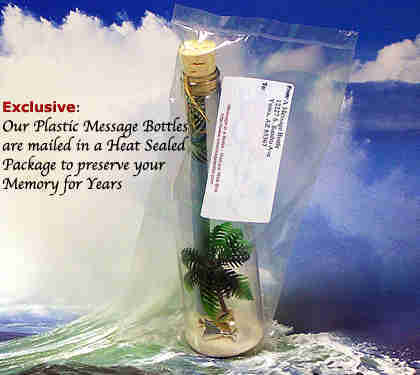 Exclusive: Price includes set up for your digitally enhanced photo image and your personalized greeting imprinted on the scroll of your choice. 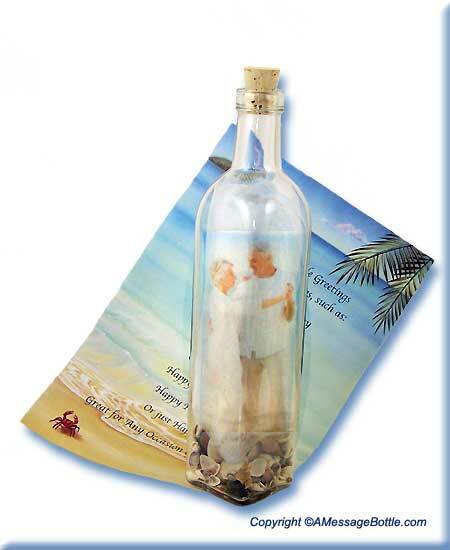 Transparent Photo, (Photo Copy Uploaded by you via the Browse Button). 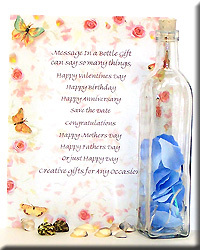 "Please allow an additional 2 to 3 business days to modify your photo prior to shipping"
Stock# - 01021tgs Message in a Bottle Blue Silk Petals - Lovely blue silk petals in a 10 inch square bottle. 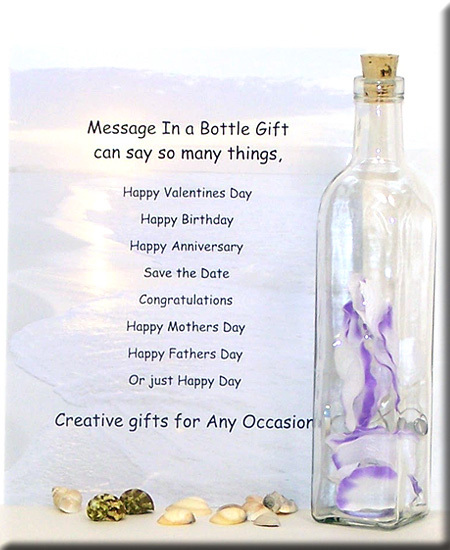 Show your passion for the one you love with a beautiful message in a bottle gift. Select a scroll from the drop down menu and enter your greeting in the box below. Stock# - 01022tgs Message Bottle Lavender and White Silk Petals - Lavender petals symbolize enchantment and love at first sight. 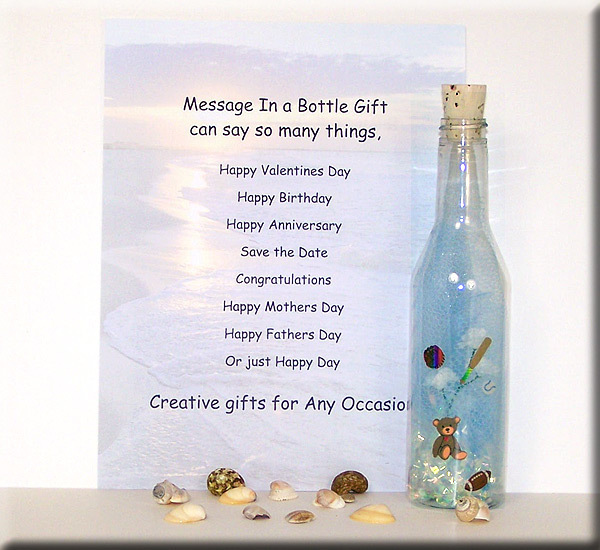 Show your passion for the one you love with a beautiful message in a bottle gift. Select a scroll from the drop down menu and enter your greeting in the box below. 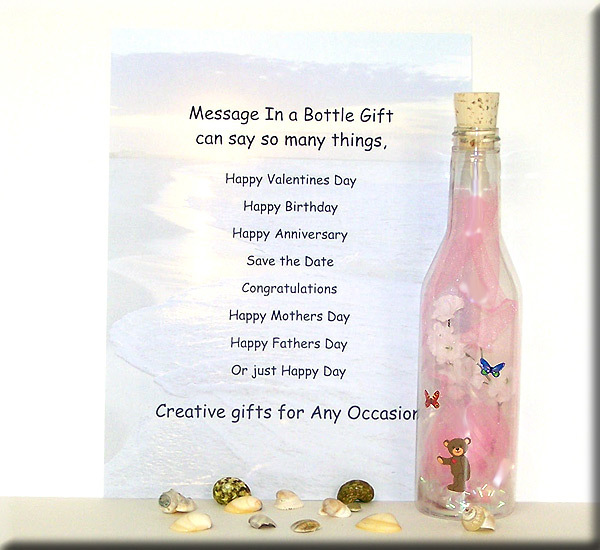 Stock# - p01013tgs Exclusive: Plastic Message in a Bottle - Send a unique Greeting to welcome a new arrival to the Family with our Message in a Bottle. Welcome or Introduce a new Baby Boy to Family and Friends in way that will not be Forgotten which creates a Memory and Keepsake for all.